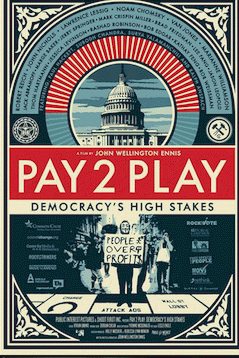 Filmmaker John Wellington Ennis: "Pay 2 Play, Democracy's High Stakes"
My guest today is John Wellington Ennis, director of Pay 2 Play, Democracy's High Stakes, his new documentary, recently released. Welcome back to OpEdNews, John. JB: We last talked in 2011 when you had already finished Free for All! and were working on this film. Before we jump into Pay 2 Play, let's first give our readers some background and context. What was Free for All! about? JWE: I originally went to Ohio looking for humorous way to convey corruption, and since Ohio was so pivotal to deciding national elections, I figured there'd be some layer of relevance no matter what. This Coingate scandal seemed so ludicrous but at the same time embodied all the problems with campaign finance, because paying for campaigns seemed to be the root of corruption. At that time, there were also lingering doubts about the integrity of the vote in Ohio's 2004 presidential election. What began as asking questions about these two topics turned into two different films. FREE FOR ALL! showed how our elections are undermined and what citizens are doing to make sure their ballots were counted. But I started to wonder -- how do names even get on those ballots, and what is in the way of average folks from running for office? That became the premise of PAY 2 PLAY. JB: Why and how did the board game of Monopoly come to figure so prominently in the film? JWE: We were finishing FREE FOR ALL!, having already cut this bigger movie in half, and we planned on calling the other half PAY 2 PLAY. When we were finishing the DVD, our animator Chris Bunz sent me something, this little ending animation with a monopoly style board and pics of some of the Ohio GOP characters that were to be in the film. My first thought was, I liked the idea of a game about corruption, but it should apply to both parties. From there, I recognized the cultural weight Monopoly still had, how sentimental people were, and yet there seemed something so off about it in retrospect, buying up utilities and evicting your friends. Examining the rules today, yes, it actually says your goal is to bankrupt your opponents, not just get the most stuff. I thought evoking this fond board game with its insidious lessons would be an introduction to the film, but Monopoly kept coming up in different ways that I felt I had to pursue. By the time I started noticing a Monopoly Man pasted around L.A., I was well into the film, but my chasing down the story behind it took the movie into directions I never imagined. In my research, I found there was a major deception perpetrated by Parker Brothers as far as Monopoly's origins, and that the truth had been buried by corporate PR and litigation. Yet when I was telling people what my documentary was about, detailing expansive corruption and far-reaching collusion, it was only when I happened to mention that the story of Monopoly is a lie, then people reacted like, "No! Not Monopoly!" I realized there was something to this that was still so sacred to people because it was from childhood, and connecting with that outrage would be key to motivating people to act. JB: Monopoly is definitely an American icon. And the street artists obviously agreed. You show up with your film to make incorporating a Monopoly theme and the Monopoly Man starts appearing all over the place. Wasn't that a bit eerie? Tell us more about how you went after that story. JWE: One lesson I took to heart from working in Reality TV is to keep producing for various storylines, because you don't know what will turn up later as relevant, even essential. In making a first person documentary, it becomes harder to visualize your internal thought process. While I was immersed in piecing together the secret history of Monopoly, and trying to figure how it might relate to whatever story I was going to tell, I started to notice posters around Los Angeles of a Monopoly Man. It seemed interesting someone else was taking this means of expression to put up their own statement using Monopoly. I thought it might be just something to show a few shots of, but as I learned about the artist and what was involved in putting up your work around town, I became increasingly fascinated by the possibilities this opened up. JB: What's the deal with street artists? Are they renegades? What motivates them? What did you learn? JWE: As a medium, I'd say street art is one of the most noble pursuits of political expression. As personality types, those who persist in exhibiting their work may have any number of motivations -- from public service, to spiritual philosophy, to self-promotion. Lots of different types participate. But the criminality aspect of what is considered vandalism certainly poses a barrier to those already heavily policed and subject to stricter enforcement. Getting to know street artists can also be tricky because they usually keep a low profile, pursue some other identity at night alone, and can have pretty combative attitudes. They can be charismatic but difficult. One thing I learned to keep in mind is, once you get the street artist off the street, you are dealing with an artist. JB: And in fact, several street artists make an appearance in PAY 2 PLAY. Why did you decide to include them in your film, besides for the Monopoly tie-in? I'm thinking in particular of the compelling young mom you interviewed. JWE: LydiaEmily is an artist who speaks in the film about being inundated with billboards that prompt her young daughters to start asking for makeup, clothes, or about their weight and size. While she is already struggling as a single mother with a special-needs daughter, how can she give voice to things that matter more? She is ultimately willing to go to jail for her right to express herself, and has had some in-depth legal problems. View All 61 Articles in "grassroots"
View All 7 Articles in "Election/Voting"